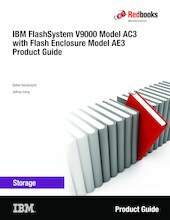 This IBM Redbooks® Product Guide describes IBM FlashSystem® V9000, which is a comprehensive all-flash enterprise storage solution that delivers the full capabilities of IBM FlashCore® technology. In addition, it provides a rich set of software-defined storage features, including IBM Real-time Compression™, data reductions, dynamic tiering, thin provisioning, snapshots, cloning, replication, data copy services, and IBM HyperSwap® for high availability. Scale out scale up configurations can now add a hot spare node to further enhance availability. With the release of FlashSystem V9000 Software V8.1, extra functions and features are available, including support for new and more powerful FlashSystem V9000 storage enclosure Model AE3. Software features added include GUI enhancements, a new dashboard, support assistance, and data deduplication. AE3 capacities include Small (3.6 TB), Medium (8.5 TB), and Large (18 TB) IBM MicroLatency® modules for between 14.4 TB and 180 TB usable capacity (TBu), with inline hardware compression increasing the capacity up to 219 TB effective capacity (TBe). New SAS-based small form factor (SFF) and large form factor (LFF) expansion enclosures that provide a mixture of nearline hard disk drives (HDDs) and flash MDisks in a pool that can be used for IBM Easy Tier®. The new IBM FlashSystem V9000 SFF expansion enclosure Model92F offers new tiering options with low-cost solid-state drive (SSD flash drives) and nearline HDDs. Up to 784 drives per node pair of serial-attached SCSI (SAS) expansions are supported per FlashSystem V9000 controller pair, providing up to 480 drives with expansion Model 24F and up to 240 drives with expansion Model 12F. FlashSystem V9000 Software version 8.1 replaces version 7.8, and is available to all IBM FlashSystem V9000 customers with current warranty or software maintenance agreements.